The War on Drugs is becoming another “Dirty War” in Mexico, with the tactic of enforced disappearances reappearing as a commonplace occurrence in the country. “Enforced disappearances in Mexico have happened in the past and continue to happen today,” the UN Working Group on Enforced or Involuntary Disappearances stated during a presentation of its findings in March. The UN Group noted that during the country’s first “Dirty War”, which lasted from the late 1960’s to the early 1980’s, enforced disappearances was a systematic State practice used against students, indigenous peoples, peasants, activists and anyone suspected of being a critic or opponent of the government. Now that this practice has reappeared in the country’s latest conflict, the UN notes that the cases of disappearances share the same patterns of widespread impunity, secrecy and lack of reparations and justice for the victims as in the past. “The refusal of the authorities to recognize the true dimensions of this phenomenon and the involvement of public officials in these crimes – whether by commission, omission, or collusion with organized crime groups – has enabled this crime to spread to many parts of the country,” Amnesty International stated in response to the UN’s findings. Since President Felipe Calderon deployed the military to combat narco-trafficking in December 2006, over 50,000 people have been murdered—more than the death toll for the 11-year war in Afghanistan. According to Mexico’s National Human Rights Commission, between 2006 and April 2011, 5,937 people have been reported lost or missing, while 8,898 murdered people remain unidentified. 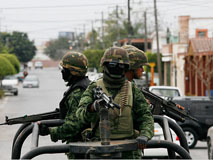 Much of this violence, which has been carried out by the Mexican government, military, and police, has been subsidized by U.S. taxpayers though the Merida Initiative, a counter-narcotics policy modeled after Plan Colombia, which provides Mexico with $1.6 billion in aid that is supposed to have human rights requirements. “Instead of reducing violence, Mexico’s ‘war on drugs’ has resulted in a dramatic increase in killings, torture, and other appalling abuses by security forces, which only make the climate of lawlessness and fear worse in many parts of the country,” said José Miguel Vivanco, Americas director at Human Rights Watch (HRW). The UN Group noted that groups targeted include women, migrant workers, human rights defenders and journalists. It also noted that although drug cartels are responsible for these acts, it received “detailed documentation” that public authorities and military personnel are believed to be responsible for numerous cases. HRW’s Vivanco added that this leaves victims’ families with the burden of searching for their loved ones. The UN also noted that the government has also consistently dismissed the crimes by suggesting that the victims were involved in illicit activities, much like how the victims of Cold War state terror in the region were often labeled communists. Mothers from across Mexico marched to the nation’s capital this past Mother’s Day on behalf of their loved ones who have been disappeared to demand justice. “For some it has been years, for others months or days, of walking alone, of clamoring in the desert of the hallways of indolent and irresponsible authorities, many of them directly responsible for (disappearances) or complicit with those who took (loved ones) away,” the mothers’ group said in a communiqué.